“The Birdman” at Pike Place Market. This is our second interview in the “Meet the Market” series. More than a year ago, I was wandering around Pike Place Market for the first time, when I met The Birdman. 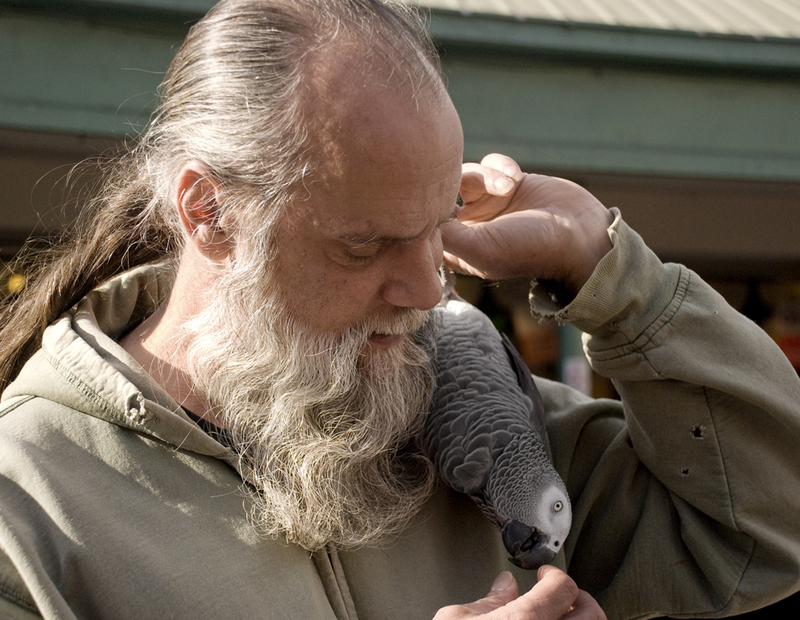 In that opportunity, I spent a fair amount of time talking to him and his gorgeous and gallant African Grey Parrot. I immediately fell in love with the smart bird, who can talk to you, lay on its back and hang out with you while “hanging upside down.” Of course, I took many photos of both the parrot and The Birdman. It was a lovely experience that I treasured as one of the best memories our beautiful Emerald City has offered to me. A few weeks ago, and now that The Market is more familiar to me than ever, I ran into The Birdman again. He was waiting for his lunch to be delivered (an insanely, delicious seafood plate). We talked for a few moments, and I told him I wanted to write about him. He was very excited to be featured on our blog. I asked him if he had another name. He only smiled back. He also told me he has been in the Market for about nine years. The Birdman is originally from the Midwest and loves Seattle. He and Phineas look like “fish in the water” when it comes to entertaining people. This happens with both adults and kids. Everyone gets to talk to them, enjoy the stories and play with Phineas, by holding or touching it! Whether Phineas is busy doing some gymnastics (like the “back summersault”) or barking like a dog (he also meows), he will always have time to give The Birdman a kiss, very close to his white beard. If you see them, don’t hesitate in talking to these two. I can assure you that, like me, you won’t be able to forget this fantastic pair. This entry was posted in Meet the Market and tagged birdman, buskers, performers, pike place market, Seattle. Bookmark the permalink.